Camille Saint-Saëns is one of those composers that outside of his native France isn’t that well known. Sure, many of us will have heard his most famous piece, Le Carnaval des Animaux (The Carnival of the Animals), if you’re a little bit deeper into classical music, you may know his Organ Symphony (no. 3). And typically, that’s where most average classical listeners wits will end. I must admit it was very similar for me until quite recently. In fact, this is the very first time I even write a blot post about this composer. The 2nd concerto starts like a Bach solo work, which as a great fan of Johann Sebastian I really appreciate. But obviously, this is concerto of the romantic era (written in 1868), and once the orchestra sets in, there is no doubt about that. The concerto isn’t very “balanced”, the first movement being nearly as long, and “heavier” than the two other movements together. You’d never be able to tell this work was written in only 17 days (it was written in a rush for Anton Rubinstein), and it is for a good reason the best known of the concertos. That said, don’t skip concerto no. 5. It is a bit more intimate, but has many beautiful moments as well. I’ve praised Chamyou for his beautiful Ravel box, and his playing is brilliant here as well. The ONF does a great job too, I believe they have a natural advantage over foreign orchestras as Saint-Saëns still gets much more air time in his home country and abroad. 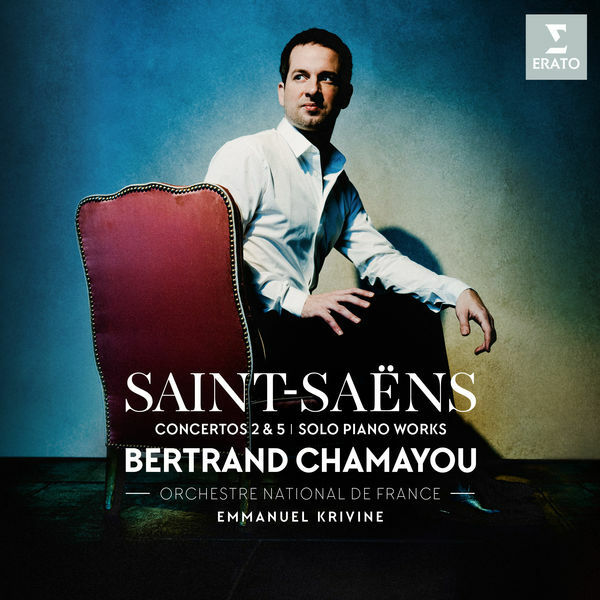 To complete the album, Chamayou also plays several of Saint-Saëns Piano works, which were completely unknown to me. A particularly beautiful example are the 6 Etudes op. 111, that really show a close relationship to Debussy and Ravel, reminding us that Sain-Saëns lived long into the 20th century (he died in 1921).